South African Wine has a long history, with South Africa ranking as one of the top 10 wine producing countries. South Africa is known for many things, a relatively mixed bag of good and bad. Of course, there is apartheid and the De Beers diamond empire/cartel and all of their negative permutations, but there is also Nelson Mandela, Zulus, good surfing, and Great White Sharks to balance the good versus bad equation. What shouldn't get left out is their wine, which is one of the good things. South Africa is not the only wine-producing country in Africa -- there is Morocco, Algeria, Tunisia, Egypt, Zimbabwe, and Kenya. But while they hardly register in the worldwide global wine economy, these wines make up the largest volume from the old dark continent and they happen to be the best wines that far outclass all others in Africa. The bulk of South Africa's wine regions are located in the southwest in an area known as the Cape. (Think, Cape of Good Hope.) Most of the wineries, or wine farms as they are known here, are inland from the coast and are influenced by both the Atlantic and Indian Oceans' maritime air. Wines from South Africa fit into a spectrum between high-end quality wines to the high volume value-priced wines for everyday consumption -- something for everyone, granted, but not always worthy of consumption. There is irony about South African wines. During apartheid, much of the world did not have access to South Africa wines and, even if available, many people eschewed them for political reasons. The U.S. imposed trade sanctions that barred imports of wines from South Africa to this country with little chance to taste. But with the long awaited cessation of apartheid, the U.S. ban was lifted and the South African wine industry, along with wine consumers, have become ancillary beneficiaries. If you know a little bit about South Africa's history, about three centuries ago the Dutch colonists arrived to be the first Europeans to settle the tribal lands. The Dutch colonists' first efforts in winemaking employed indigenous wild grapes with the resulting beverage falling far below par. 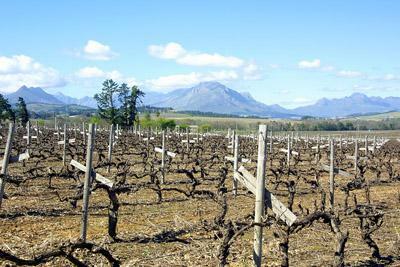 Spurred on by Jan van Riebeeck, the early colony's leader, French vines were imported for planting. The initial purpose was not necessarily for making wine, but for scurvy prevention for the Dutch East Indies' sailors stopping on their long voyages to the east along the spice route. The first grape varietals thought to be planted were Chenin Blanc and Muscat. On February 2, 1659, the first wine pressing was made from these French grapes and the long history of wine production in South Africa began. Phylloxera, that dastardly vine root killing bug, wreaked havoc on South Africa in 1866. It took decades to rebuild the industry after that, but this bug plague also helped create South Africa's current industry structure. In the aftermath of the plague, vintners planted heavily, primarily with Cinsault, which in turn led to inflationary prices and a glut of production. There was so much wine that it was actually being dumped in rivers. In 1918, a wine cooperative, the Cooperatives Wine Growers Association (KWV), was created and given legal authority to control production and set prices. The KWV became the legal governing body and the sole channel where wine could be produced and sold. It has restructured over the ensuing years and its power has waned with many independent companies and cooperatives rising up and producing independent of the KWV. Still, the cooperative holds about 25% of the wine industry under its sway and influence. This break from the KWV started in the mid-1980s and has led the industry away from the high volume wines that could best be described as simple, but more often than not, poor. It was the rise of these private producers and independent cooperatives that have pushed South Africa's wine to a higher grade level and made them, at a minimum, at least interesting. Climate and geology play a critical influence on the type of grapes grown and wines made. The majority of South Africa's wine regions are located in the Cape's cooler climes which also dictates the grape varietals, some doing better than others. The following is a quick survey on the most commonly found. White grape varietals predominate the field. The traditional Chenin Blanc, often called steen, is still in heavy production. There is also Muscadel used in Sweet Wine as well as Riesling to make late harvest sweet wines as well as dry whites. Chardonnay is getting more attention from growers and these wines are made in a modern style with an oaky perspective. Sauvignon Blanc has been growing in popularity among growers, perhaps taking a page from New Zealand, these dry wines are grassy, herbal, acidic, and are sassy with fruity personality. Cabernet Sauvignon does well in South Africa and makes an excellent Bordeaux-style red. Cabernet Franc and Merlot help round out other Bordeaux varietals, but these are minor and used more in blending. Pinot Noir has also shown up here but has not reached the high plateaus of Burgundy, or even California and Oregon. The most luminary red is Pinotage, a unique regional hybrid of Cinsault and Pinot Noir. The resulting wine is an intriguing red that is rustic with gamey appeal, complexity, and spiciness. Shiraz is developing a strong following here as well with its big fruit, smoke, tar, and sturdy tannins. This is a relative newcomer but Shiraz/Syrah is growing in popularity. The higher quality wines are from regions generally closer to the Atlantic and Indian Ocean's coastline. Towards the interior, it gets stove-hot and produces wines that are unruly, course, and overripe. There are more than a dozen wine regions, but there are three that rule the roost. The following highlights these better regions known for producing good quality wines. This is the historic region for South Africa where the first vineyards were planted. It's a small region outside of Cape Town. It's one of the top regions and produces excellent Sauvignon Blanc, Chardonnay, Semillon, and Muscat. Some of the best producers are Groot Constantia and Klein Constantia. And by the way, Napolean particulary was fond of Klein's Vin Constance Muscat…but what would a lowly Army corporal know? This is another important wine region inland and to the northeast of Cape Town. There is more diversity in wines here with dessert wines, Sherry-like wines, as well as whites and reds being made by many of the country's best estates. You will find excellent Cabernet Sauvignon, Shiraz, Pinotage, Chardonnay, and Chenin Blanc. Look for Glen Carlou, Nederburg, , and Fairview Wine Estate. This last estate is also owned by wine maverick/entrepreneur, Charles Back. His Fairview empire also includes the whimiscal Goat Do Roam winery that focuses on Rhône-style wines and Spice Route which makes an excellent Sauvignon Blanc. This is probably the best and largest of the wine regions -- South Africa's equivalent to a California Napa Valley. There are more than 80 wineries in this region just to the north outside of Cape Town. There are great whites and great reds from Stellenbosch. Here is a smattering list of some of their best: Kanonkop, Simonsig, Warwick, Thelema Mountain Vineyards, Mulderbosch, Beyerskloof, and Meerlust. Other key wine regions include Worcester, Klein Karoo, Franschhoek Valley, Mossel Bay, Elgin, and Walker Bay. While not at the same rank as Constantia, Paarl, or Stellenbosch, these are noteworthy and can produce outstanding wines as well.